I set out to take a true vacation, one free from work, which rarely happens as a freelancer. That has mostly been the case. 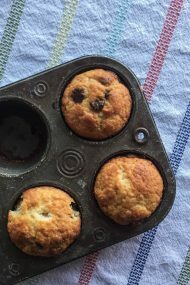 By day two, though, I found myself in the kitchen making these Chocolate Chip Pancake Muffins, and couldn’t pass up the chance to record them to share with all of you because they are that good, and that fun (to eat and make). I should preface day one was a very wet, windy, grey day that tested all the rainy day tricks I had up my sleeve. We watched Ghostbusters, both the original and sequel. Stop judging, it was the one channel we finally landed on that had reception at the house we rented. By choice, we also watched Disney’s Descendents 2. I’ll confess this wasn’t as bad as it sounds, only because it was a great chance to chat and cuddle with Virginia. We also played 12 rounds of Scattergories, one game of Life, and by evening’s end watched a few episodes of the Great British Bake Off’s Masterclass. See, that first day of vacation, huddled in the house, felt like four days. I wouldn’t trade it for a sunny day, though, because I’ve been feeling like we all needed to slow down big time. Come fall, our lives go back to the busyness of school schedules and homework with the girls returning to their small, wonderful private school in Woodstock. This past year has been amazing. I didn’t know what to expect, and will confess the feeling that a few friends thought it would be an epic debacle since patience isn’t my strongest skill. Our year of homeschooling surprised everyone, including us. It gave me the gift of an incredible bond with my teenager. I can honestly say aside from Isabella being my daughter, she’s a truly wonderful human being. She’s had a much heavier emotional load than some of her peers. Both my girls carry a huge weight from their loss. 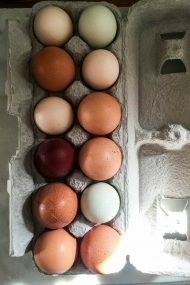 The night we arrived, I went into the supermarket to get some milk, eggs, and a few other perishable items I hadn’t packed for the trip. It should’ve been and in-and-out stop, so the kids decided to wait in the car. Long lines and not enough cashiers delayed me. When I got back to the car, Virginia was in tears, worried about what took me so long. She said all her mind could think about were the worst-case scenarios—me collapsed in the supermarket. That is the last image she has in her mind of her papa, crumpled on the sidewalk a few blocks from our home in Brooklyn. I long for the day the millions of amazing memories overshadow that one awful moment. For Virginia, though, she was only three years old when Michael passed away, too young to really remember anything. This is why I work hard to keep all those happy memories alive, to bring their papa back to life with every silly, funny, happy story. My ex once told me that I talked about him too much to the kids. Much as I knew that was the beginning of the end for us, it’s not until writing this that I realize how cruel his words really were, even though I know they stemmed from jealousy and his own insecurities. I swear I didn’t sit down, intending to fall down this rabbit hole, but sometimes writing is very much like life, and takes us to unexpected places. Cooking is like that, too, and that’s how we’re going to change the subject from this quite heavy tone to a much lighter, tastier one. 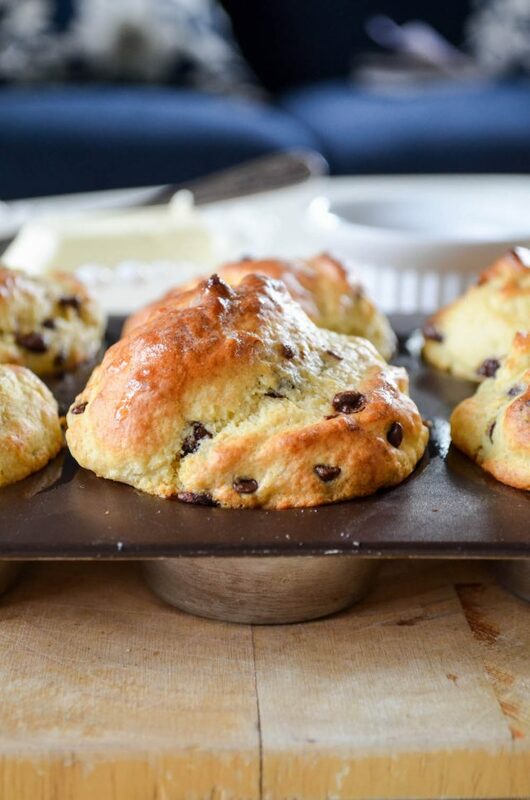 One might not think to take pancake batter and bake it up in muffin tins, but then one might not have daughters who’s goal is to be as opposite as possible. They don’t always agree on waffles or pancakes. 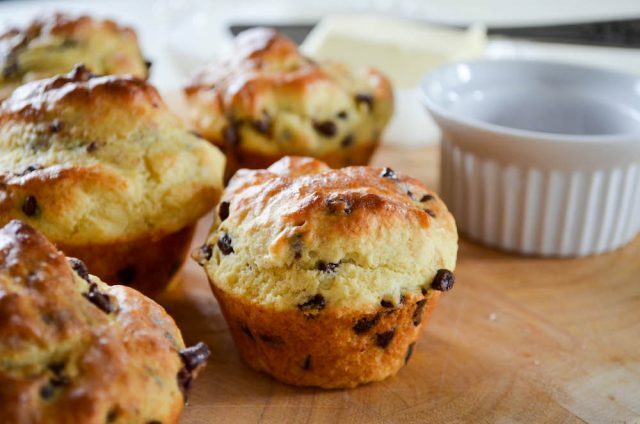 Muffins, though, are always a common denominator. That’s why I set about making these Chocolate Chip Pancake Muffins on the second day of our vacation in Wellfleet, MA. I opted for a traditional pancake recipe, instead of fluffy buttermilk pancakes, feeling the muffins would need more structure, and benefit from being a bit dense. 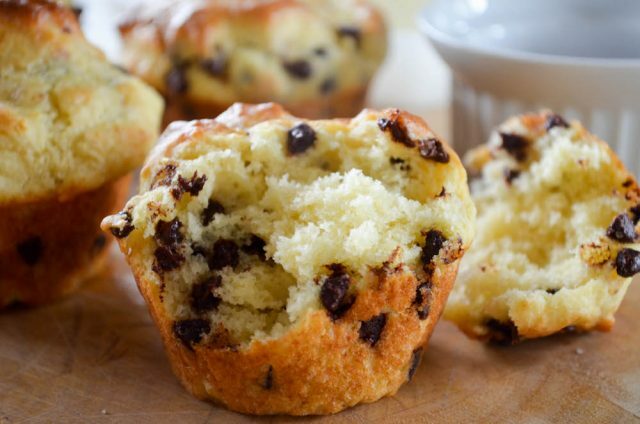 That last part might seem counterintuitive to making muffins, but it works wonderfully. I didn’t have any vanilla extract with me, so if you have it on hand, and want to tip in a bit, go for it. I listed the chocolate chips as 1/3 cup. Truthfully, I shook a little more into the bowl after looking at it, feeling like the batter needed more. I’m sorry for the lack of measurements on the chips. My scale batteries went kaput mid-baking. Preheat the oven to 375ºF (190ºC). 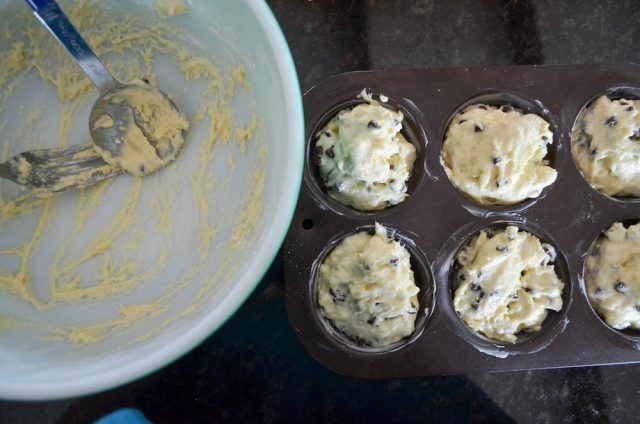 Generously butter the bottoms and sides of a 6-cup muffin tin. Set aside. 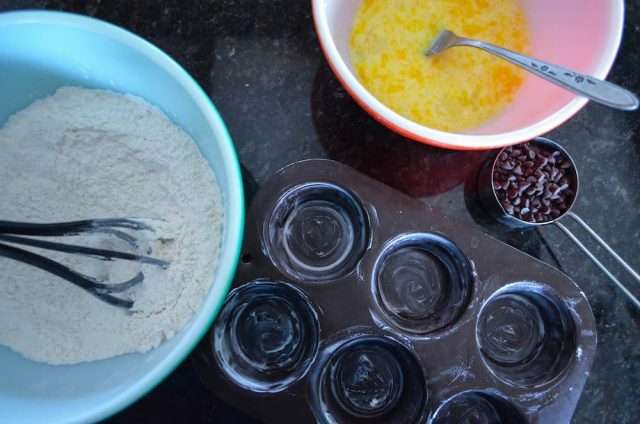 Combine the flour, baking powder, and salt in a medium bowl. Whisk to mix. 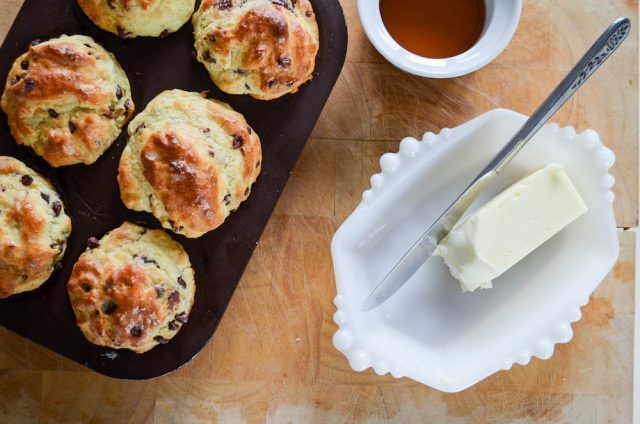 Melt 1 tablespoon of the butter—no need to let it cool. Combine the milk, egg, syrup, and melted butter in a small bowl. Whisk until well blended. Pour over the flour mixture. Stir with a fork until just combined (it’s okay if there are a few lumps). Stir in the chocolate chips. Spoon into the prepared muffin tin—it’ll look quite full, don’t worry. Bake 15 minutes, until deeply golden on top. 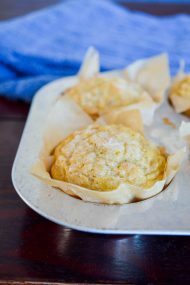 Use the remaining pat of butter to rub the tops of the muffins as soon as they come out of the oven. Arrange them on a platter, and serve immediately with a little bowl of syrup for dipping. These sound AMAZING! What a great idea. 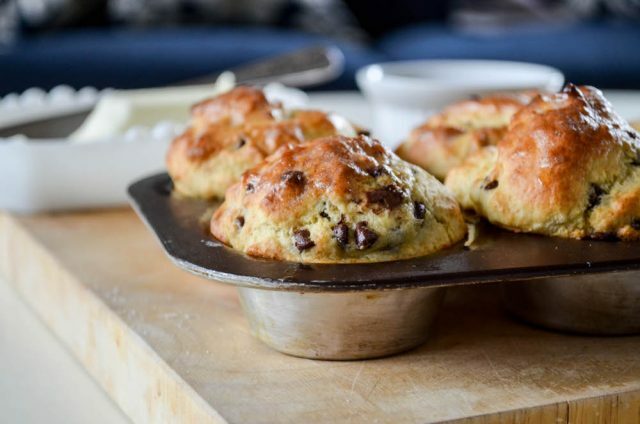 I’ve dumped pancake batter into a skillet for a giant pancake before (YUM) but never into muffin tins. I so need to try this with blueberries! Definitely need to make these!